Be prepared to be trolled big time in Troll Face Quest Video Memes and TV Shows game. You’ll laugh or be very frustrated. Use creative ways to solve each level. Each level is bizarre which require you to think out of the box and totally hilarious. Feel free to use the hint when you stuck on the game. 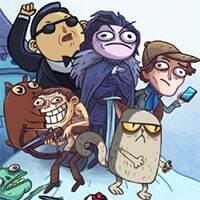 Enjoy and have fun in playing Troll Face Quest Video Memes and TV Shows Game. Good luck. This game is one of our Puzzle Games at Round Games. This game is also tagged as a logic and fun game. To play even more free games, view our most played and all games pages. If you want to play more games like this game: Then you can simply check out the games inside the game tags that are the most relevant to your interests or check the Puzzle Games category or check the related games section at the end of the game page. Also make sure to check out Troll Face Quest TV Show Game, you may enjoy playing it.